How can artists make meaningful work today? How can art create human connections to make the world a better place? How can we face the enormous challenges put in front of us and how can we better understand and grow solutions collaboratively? Play and performance inform our layered and complex works that delight in subverting historical, literary and art references. Our photography and video works sublimate individual ego and draw from a diverse and eclectic range or sources to create alternative realities. It is On the seam of things that most of our works develop and evolve; this seam is a point of connection but also a space of friction, tension and inevitable fragility. For us this territory reflects a basic human condition ...to connect, work, play and test the space we inhabit in order to grow... and deal with crisis. 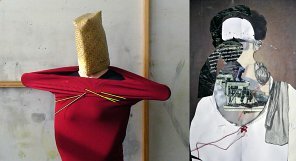 Our collaborative work interweaves drawing, painting, performative activities, video and installation with photography. A connecting thread is the use of the black ground as motif and the bright spectrum of colours alluding to the tensions and dichotomies inherent in life. We continue to be curious about the concept of the doppelgaenger as the underlying motif to probe the 'I' and the 'not I' in order to play out scenarios of being. The challenge is to push outside the known, the accepted, borders and our comfort zone to challenge and broaden our understanding of the world we are living in - for us and the viewer participating in our practice. Dr. Barbara Garrie features them in an article The Magic of Edwards + Johann in Art New Zealand Issue #152 plus they were Feature artists in the latest issue of ArtZone No 57 with an interview by Catharina van Bohemen entitled Artistic Toils X2. Edwards + Johann artists and collaborators have been working together since 2007. 2014, 2015 and 2016 were exciting years for the duo. They have been Supreme Winners of the New Zealand Painting and Printmaking Award 2016, the LACDA 2014 International Juried Competition; Finalists in NZ Painting and Printmaking Award 2014 and 2015; Finalists in The Wallace Art Awards and their works selected to be a part of the Award Winners & Traveling Finalists show 2014, 2015 and 2016; Finalist in the Parkin Drawing Prize 2013-2016 and Finalists in the National Contemporary Art Award 2014 and 2015. They had a major exhibition, Rebels, Knights and Other Tomorrows, with the Christchurch Art Gallery Outer Spaces Projects 2014 and were featured in the CAG Bulletin with an article Thieves in the Attic by Sally Blundell. As Artists in Residence 2014 at Otago Polytechnic, School of Art they accompanied the residency with an exhibition at the DSA Gallery - On The Seam of Things. January-March 2015 they undertook a three month residency at the prestigious Altes Spital, Cultural Centre in Solothurn/Switzerland which they completed with a successful exhibition and life performance piece engaging the audience. They have been international Artists in Residence in France and Scotland in 2009 and 2010. Currently, they both live and work in Christchurch, New Zealand. Edwards + Johann gratefully acknowledge the support of The Arts Council of New Zealand Toi Aotearoa - Creative New Zealand.